New York state's attorney general joined the growing list of those angered by news of American International Group's bonuses, and wants to have details on his desk this afternoon about who is getting it rewarded. Attorney General Andrew Cuomo says his office will investigate whether recipients of the payments were involved in the insurance giant's decline and whether the payments are fraudulent under state law. In a letter to CEO Edward Liddy, Cuomo said he's been investigating AIG compensation arrangements since last fall and would issue subpoenas at 4 p.m. EST Monday if he didn't get the names of employees scheduled for bonuses plus information about their work and contracts. "Covering up the details of these payments breeds further cynicism and distrust on our already shaken financial system," he wrote. "Taxpayers of this country are now supporting AIG, and they deserve at the very least to know how their money is being spent. And we owe it to the taxpayers to take every possible action to stop unwarranted bonus payments to those who caused the AIG meltdown in the first place." Earlier Monday, President Barack Obama said he's asked Treasury Secretary Tim Geithner to pursue "every single legal avenue" to block the payouts. "Under these circumstances, it's hard to understand how derivative traders at AIG warranted any bonuses, much less $165 million in extra pay," the president said. "How do they justify this outrage to the taxpayers who are keeping the company afloat?" The Obama administration is looking for ways to recoup at least some of the money reports CBS News correspondent Peter Maer. The White House continues to negotiate with AIG to bring any payments in line with the government's priorities, an administration official told CBS News. The administration official said that the bonuses "long been known about inside and outside AIG. But we didn't want to accept them." "This isn't just a matter of dollars and cents. It's about our fundamental values," Mr. Obama said at the beginning of a speech at the White House on lending to small business owners. Maer reports that the White House is seeking what are described as "mechanisms" to recover money spent on bonuses, but the company insists some of the bonuses are part of legally binding contracts signed before the government's bailout. The administration is concerned that public reaction to the bonuses could affect the president's overall economic agenda, reports Maer. "It is unacceptable for Wall Street firms receiving government assistance to hand out million dollar bonuses, while hard-working Americans bear the burden of this economic crisis," the official told CBS News. Meanwhile, AIG disclosed Sunday that it used more than $90 billion in federal aid to pay out foreign and domestic banks, some of whom had received their own multibillion-dollar U.S. government bailouts. Are We Taxpayers - Or Suckers? 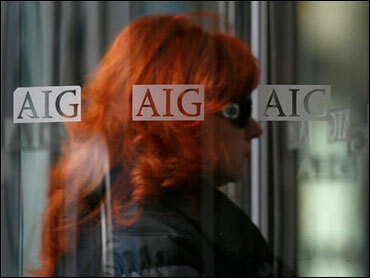 Will AIG Flap Lead To Obama Backlash?